Remy Savage is the bar manager at Little Red Door in Paris. He makes two cocktails for us, the first one with cognac and calvados, the second one with gin and clay. Hi, I’m Remy Savage and I’m the bar manager at Little Red Door in Paris. I began working in bars to pay my scholarship, like most people. The bar was an Irish pub in Lyon owned by my family, so I spent more than 4 years working there. My girlfriend moved to Great Britain and I chose to follow her. Deciding to concentrate on cocktails came step by step, with my desire to discover new flavours, have more fun with combinations and my changing tastes. 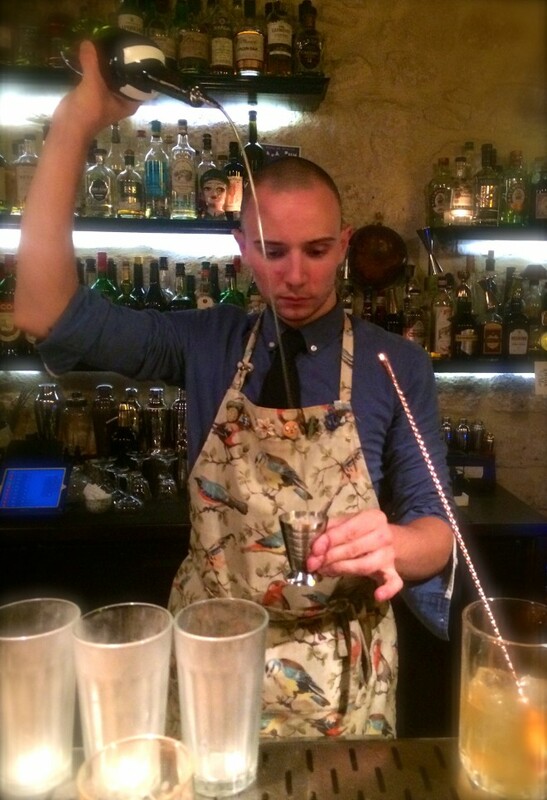 So I started in cocktail bars in the UK, then worked in Thailand and for the last 2 years in Paris, and I love it. It would be the same as Little Red Door. A comfortable place, focusing on hospitality and service. A small place where you have to time to chat with clients. I mainly go to pubs to have fun. If I go to cocktail bars it’s more to check out new techniques and ideas and try new flavours. I love scotch as it’s so plural and different. There is a scotch for people who don’t like scotch and for those who like calvados or chartreuse. I love speyside for it’s floral taste, as I am not a big fan of peatiness. But to mix I prefer mezcal for its terroir side with a wide range of tastes. It’s all about balance, good products, the bartender and the ambiance. Even the chair plays a role. When a customer is comfortable they feel more social and want to converse with the bartender about their cocktail, then they enjoy it even more. I love to work with salt. You put sugar in salty dishes in Asia and it’s the same with salt in sweet drinks. You can really taste the difference in a Martini or a Negroni, even in a Gimlet. At the end it becomes essential. My favourite bar in the world is the Zetter Townhouse in Clerkenwell, London, or try their new one in Marylebone to meet my pale Steve. My new baby is named Zeta, partly because of this bar.